Deep upper back pain can be very difficult to diagnose and manage. The upper limb tension test and Spurling's sign are used, together with reflexes and patterns of altered sensitivity to make the diagnosis. The villain of the peace, disturbing your nights and causing a deep constant ache, is often an irritated nerve supply to the rhomboid muscles which are pure C5; or the levator scapular which is also mainly the fifth cervical, but also with contributions from the third and fourth. They are innervated by the dorsal scapula nerve that comes from the mid neck; specifically the C5 root. The dorsal scapular nerve supplies the upper back muscles. Neuro anatomy is a difficult subject so just scroll down if you're really not interested in the following paragraph. Sorry, but there's always a tidbit to stretch you. Notice how this nerve complex lies in the groove just behind the collarbone. Notice the two terms root and ramus below. This page was last updated by Dr Barrie Lewis on 18th March, 2019. Deep upper back pain is difficult to manage for a number of reasons. It's an area more difficult to adjust than other parts of the spine. Diagnostically, it's a complex area. It could be a referred medical problem like lung or rib pathology, in addition to the multiple possible chiropractic conditions that can cause this distressing ache. The underlying cause could be something ergonomic and not easy to change. Feeding a baby, long hours at the computer, or behind the wheel of a car, truck or bus can certainly be the problem. An old whiplash injury may have caused degenerative change in the joints of Luschka or the facets in the lower neck. And in general the transition areas of the spine, of which the cervico thoracic junction is but one, are recognised to be clinically challenging. Shoulder conditions typically cause rhomboid ache as you have to recruit other muscles to raise the arm. 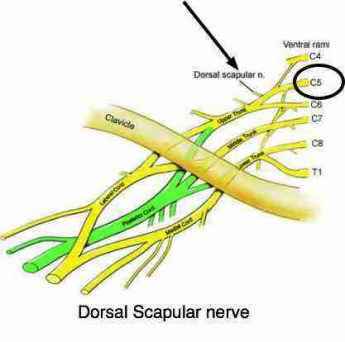 The dorsal scapular nerve is primarily from C5, being sensory and motor; it emerges from the "dorsal ramus" seen below, supplying the upper back. The "ventral ramus" supplies the arm. There are two "roots"; one is sensory, the dorsal root, bringing information in from the fingers tips for example; pain, touch, position sense, mechano receptors and so on. 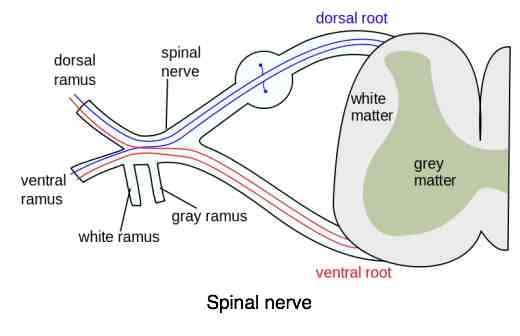 The other "root" is motor, the ventral root, taking information from the "grey matter" in the spinal cord to the muscles, for example. If you want to raise your arm, the stimulus to the muscle is relayed along the ventral root. Tingling in arms and hands gives vital clues as to which nerve root is involved in the deep upper back pain. Thumb and forefinger tingling? Then the dorsal nerve "root" of the C6 nerve root is being irritated. Can't do a press up? 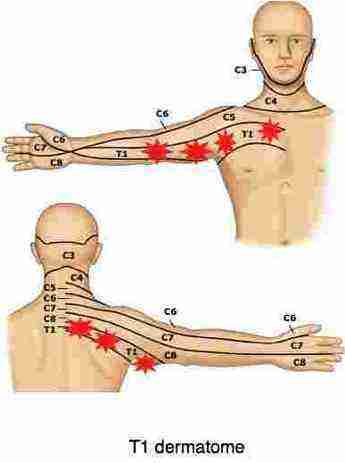 Then it's probably the motor "root" of C7 that is pinched because the triceps muscle is weak. Trivial details for you, vital stuff for your chiropractor. Then the two roots join (ignore that bump on the dorsal root) to form a "spinal nerve." (Ignore the white and gray ramuses or rami too). Then the spinal nerve divides into two "rami". Singular "ramus." It's the ventral ramus of C5 that goes on to form (in part, continuing to form the Median and Ulnar, and other, nerves that supply the arm) the Dorsal Scapular nerve. The nerve that innervates our two muscles, the Rhomboids and the Levator Scapular. 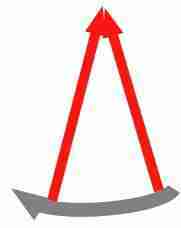 Inter scalene triangle is bordered by the anterior and middle scalene muscles (in red), and the first rib below (grey). 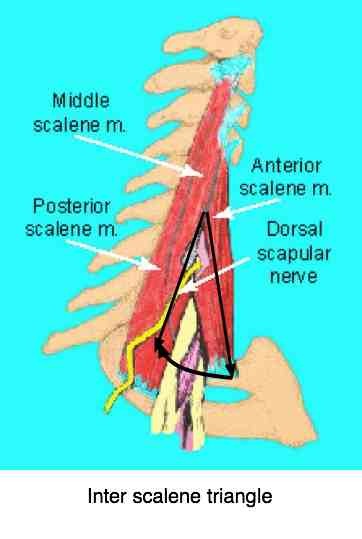 From there, the Dorsal Scapular nerve enters the Inter Scalene Triangle and, instead of passing through it, penetrates through the belly of the Medial (middle) Scalene muscle, one of the boundaries of the triangle. After penetrating the medial scalene, the dorsal scapular nerve descends, piercing the Levator, and sending off branches to innervate that muscle, and proceeding to supply the rhomboids. 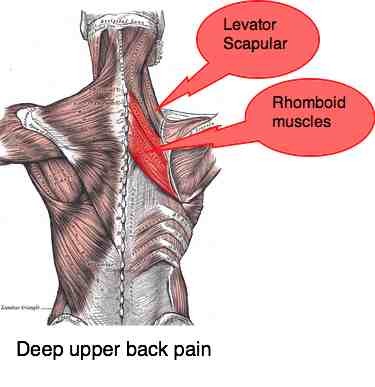 Anywhere along this path, the nerve root, or as it passes through the inter scalene triangle, through the medial scalene muscle, or whilst piercing the levator scapular, there is the potential for irritation; deep upper back pain. What medical causes should be included? Let's admit they aren't common, but they must be considered. The only patient that I recall to appear at my clinic with deep upper back pain caused by lung cancer was my father. It had already been diagnosed and surprisingly his last days were greatly helped by gentle chiropractic treatment of his deep upper back pain. The cause, not subluxations, but referred pain from the cancerous tissue in his lung; smokers beware. Secondary cancers, particularly from a primary breast cancer, to the ribs are always a concern in Chiropractic clinics, even years after breast CA patients have been declared clear. The rule with cancer is, change your lifestyle or it will probably come back. There's a fine line between what I call a health nut neurosis and a determination to completely change your way of life. Others? I'm sure there are plenty, but lets be realistic: when you hear hoofbeats, don't think zebras! Pancreatic cancer causes deep upper back pain, heart attack causes neck and jaw, back and arm pain. A C5 nerve root lesion. A cervical facet syndrome, a cervical disc syndrome, or joints of Luschka degeneration. 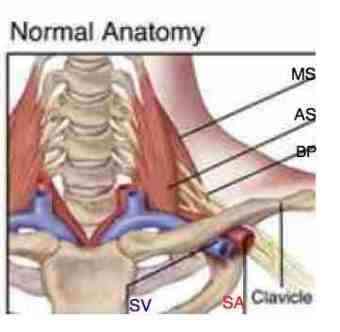 Poor posture at the computer, car or truck causing medial Scalene or Levator Scapular chronic tightness. In short, there are a lot of possible causes of deep upper back pain. The C5 nerve root, affected for example by a slipped disc in neck supplies sensory innervation to the skin on the side of the upper arm extending down the lower arm towards, but not including the thumb; and muscular innervation to numerous muscles, but usually the biceps and the biceps reflex would be tested. The deltoid is another muscle often tested for C5, but truth is that there has often been a low grade irritation of the nerve (axillary nerve, C5/C6) leading resulting in painful shoulder pathology such as rotator cuff syndrome ... resulting in pain inhibition during testing. Because both the biceps and deltoid (and all the other muscles of C5, bar rhomboids) are supplied by C5 AND C6, true neurogenic weakness is not common. A key sign is the so-called Shoulder Abduction Relief sign in which relief is obtained by placing the hand on the head. It takes the stretch off the nerve root. Conversely, the Upper Limb Tension Test (a test you can do at home) places increasing stress on the nerve root producing tightness, pain and tingling in the arm. The upper limb tension tests confirms whether there is a pinched nerve causing the deep upper back pain. 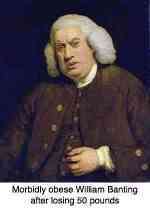 Spurling's sign will often be positive too; turning to the same side, and then looking up, reproduces the pain. These roots are not likely to cause upper back pain, but rather pain and tingling in arms and hands, and especially the lower arm and fingers. A T1 nerve root is a primary candidate of suspicion when dealing with deep upper back pain, usually extending in this instance down the inner arm, and sometimes to the chest. Again the SAR and ULTT tests will be positive. Specific muscle weakness in the hand will be sought by your chiropractor. In particular, opposition of the thumb and pinkie, and those that you would use to squeeze your fingers together, the PAD myos, and apart, the DABs. Deep upper back pain, and tingling down the inner arm, and weakness in the hand equals a T1 nerve root lesion; or a C5 dorsal scapular problem. Only a careful and thorough examination can work it out. Cervical facet syndrome is probably the most commonly treated cervical spine condition in chiropractic clinics; it may be well the cause of your deep upper back pain. 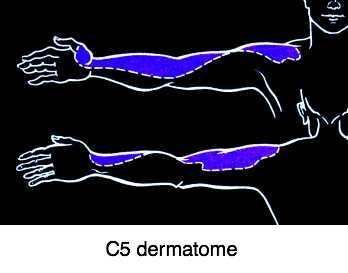 Both the C5 and T1 lesions, if severe, will produce radiating pain when turning the head to the side of pain and then looking up. If extra downward pressure is exerted by your chiropractor, then it's called Spurling's test. In short, does turning to the same side produce deep upper back pain and/ or tingling and pain in the arm. Another part of the examination that your chiropractor would do is the cervical compression test; this is a fun page, don't miss it! Thoracic outlet syndrome is an oft missed cause of tingling in the arms and hands. I won't write much here as there is extensive coverage of the Thoracic Outlet Syndrome at this Chiropractic Help website. The key sign is that elevation of the arm, instead of relieving the symptoms, makes them worse. Both the artery and the bundle of nerves called the "brachial plexus" are irritated primarily by a subluxated first rib. It is diagnosed using a difficult examination known as Adson's test. 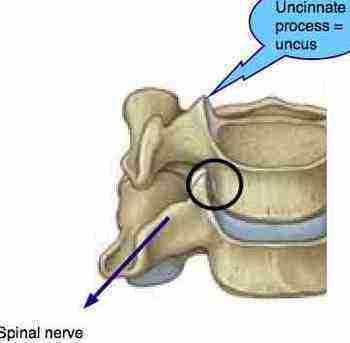 Scheuermann's disease may cause deep upper back pain started as a teenager, and continuing into adulthood. Chiropractor care, help or scam? The back of the blades between the T1 and up to the neck; how is it possible to treat the injury? Neck and deep upper back pain - Jameela. Can't do triceps action in right arm - Babil.